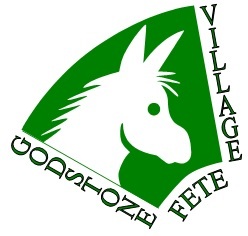 The annual Godstone Fete and Donkey Derby was held on 31st August 2015, and despite unfavourable weather was very much a success. Fortunately much of the preparatory work had been carried out over the weekend in dry weather. The Fete got off to a spirited start with Jane Cooper from Godstone Crafts performing the opening ceremony. There was the welcome return of the dog show along with the varied range of stalls and attractions. Unluckily the day started with light drizzle, which got heavier through the later part of the morning, but stopped at midday giving welcome relief for the afternoon. There were very few cancellations by stallholders and all our wonderful helpers were impressively stoic. The number of visitors was surprisingly high and all helpers, stallholders, and attraction operators did a splendid job. There were few concessions to the weather and the jockeys survived unscathed.